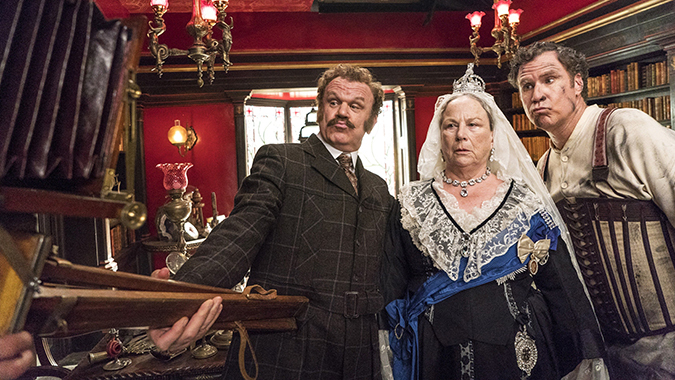 Fan-favorite comedy duo, Will Ferrell and John C. Reilly (Talladega Nights: The Ballad of Ricky Bobby and Step Brothers) team up for a brand-new take on the timeless characters of Sir Arthur Conan Doyle in HOLMES & WATSON, debuting on Digital March 26, and coming to Blu-ray and DVD April 9 from Sony Pictures Home Entertainment. Go back in time to witness the legendary detective Sherlock Holmes, played by Will Ferrell (Anchorman), and his trusted sidekick John Watson, played by John C. Reilly (Stan & Ollie) as they are tasked to solve a murder at Buckingham Palace before the Queen becomes the killer’s next victim. Rebecca Hall (Vicky Cristina Barcelona), Rob Brydon (The Trip), Kelly Macdonald (No Country for Old Men), Ralph Fiennes (Grand Budapest Hotel) and Lauren Lapkus (“Crashing”) round out the entertaining supporting cast. Writer/director Etan Cohen (Men in Black 3, Tropic Thunder) helms the historical caper. 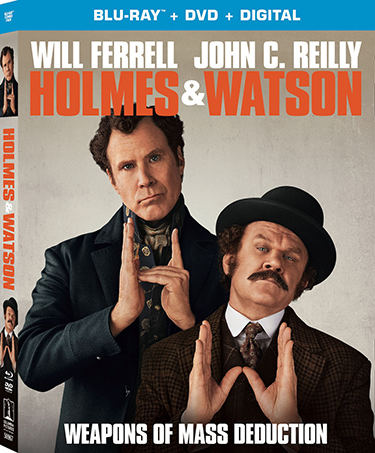 HOLMES & WATSON’s Blu-ray, DVD, and Digital bonus features are filled with never-before-seen footage, including eighteen deleted and extended scenes, a Line-O-Rama full of improv and outtakes as well as three new featurettes. In “Will and John: Together Again,” watch the film’s stars’ incredible comedic chemistry in their first film back together in a decade, as they reminisce about their experience working together and revel in their on-set antics. “Seriously Absurd: The Cast” shows how Rebecca Hall, Lauren Lapkus, Ralph Fiennes and Billy Zane manage to keep straight faces during production. Finally, “Mrs. Hudson’s Men” proves why the world’s most famous artists, scientists and authors can’t resist the allure of Kelly Macdonald’s Mrs. Hudson. HOLMES & WATSON is presented by Columbia Pictures in association with Mimran Schur Pictures, and Gary Sanchez/Mosaic. The film is written and directed by Etan Cohen, executive produced by Chris Henchy, Jessica Elbaum, M. Riley, David Mimran and Jordan Schur, and produced by Will Ferrell, Adam McKay, Jimmy Miller and Clayton Townsend. Will and John: Together Again: Nearly Step Brothers, Will Ferrell and John C. Reilly possess and an incredible comedic chemistry. Watch their antics on the set of Holmes and Watson as they reminisce about their hilarious history. Seriously Absurd: The Cast: Serious about the craft of acting, Rebecca Hall, Lauren Lapkus and Ralph Fiennes and Billy Zane attempt to keep straight faces working on a set with Will Ferrell and John C. Reilly. Mrs. Hudson’s Men: The world’s foremost artists, scientists and authors could not resist the allure of Mrs. Hudson. HOLMES & WATSON has a run time of approximately 90 minutes and is rated PG-13 for crude sexual material, some violence, language and drug references.